2.2 How To Enroll in Aadhaar Card? 2.3 How can check Aadhar card status? 3 How To check Aadhar card Update Status? The UIDAI is first introduced in January 2009. 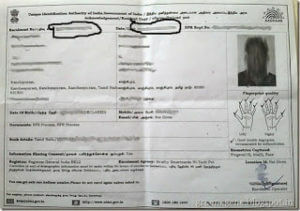 Nowadays Adhar card is mandatory almost everywhere which is issued by Unique Identification Authority of India (UIDAI).The Aadhar card is unique with UID number. Nowadays Aadhar is used everywhere for all purpose like Proof of Identity etc. As We know Now Government provides most of the benefit could include things like government subsidy on various platform. Step 1.Click on below link to visit UIDAI Aadhar Official website. Step 2.In this Screen, you’ll see Two Option (Enrollment Id, Aadhar Card,Virtual ID) If you do not have Aadhar Number then Choose Enrollment Id. Step 3.Then you need to fill the detail of your enrollment slip Or Aadhar Card. In this Screen, you need to Enter Enrollment Id With Date and Time.The Given above Image Highlighted specific Value that you need to Enter to Download E Aadhar. Note:(Enroll. Id Format(xxxx/xxxxx/xxxxx) Date Time (00/00/0000 12:12:12)). Step 4.:If you have Chosen Adhar Card then You Need to Enter 12 Digit your Aadhar Number In Box. (Adhar Card Number In This Formate (0000/0000/0000)). Enter Captcha Code that shows you. Click on Send OTP Button. Step 5. Check your Mobile and Enter OTP in The last box and click on Verify and Download. Finally, your EAadhar card is downloaded. you can open and Enter your password of E Aadhar. How to Download Aadhar card without Mobile Number? Somehow At a time of Enroll in Adhar card you might forgot to register Mobile number with Adhar card. So people do worry about It. but Aadhar card download without mobile number also possible.here we you’ll find how? Please Follow Step For E Aadhar. Step 1. Visit UIDAI Website Just Click bellow Button. Step 5. Enter OTP and Download Your E Aadhar. If you any Question-Related Aadhar Then Comment Us We are Happy to Help You. How To Enroll in Aadhaar Card? Every Indian people compulsory need to enrol in adhar card. The process of Appling Aadhar card is not available online. So you need to book an appointment at Aadhar center for enrollment. follow the given step to get Aaadhar. The initial step is to book an appointment in nearest aadhar center. also it possible through the online aadhar book appointment UIDAI Portal. on official site fills the necessary contact detail with the nearest centre along with date and time. After successfully booking the seat, you need to visit specific Aadhar center with a necessary document on given time. After your enrollment, Aadhar service provider gives you enrollment slip. Please Don’t forget to register a mobile number with Aadhar. After some days, you’ll receive Aadhar number in your register mobile. Then within 1 month your Aadhar card will be delivered to your residential Address by UIDAI authority. As per UIDAI’s website, there are 3 ways to update or correct your Aadhar card details.UIDAI Provide Best Facility to Update Aadhar Online.The Uidai provide 3 way for Aadhar card Update. Here We Give Information about how to update Aadhar. How can check Aadhar card status? After Updating or new enroll in aadhar card so need to check aadhar card status online or aadhar update status.So don’t worry using below link you can track aadhar status by enrollment id. Aadhar card website provides online facility to update Aadhar card status and much more related to updating aadhar by self etc. Thank for above share information but i unable open downloaded Eadhar Card its showing wrong password. so reuest you which password i typed to open Eadhar card. UIDAI has changed the password formate to open downloaded soft copy of aadhaar card. 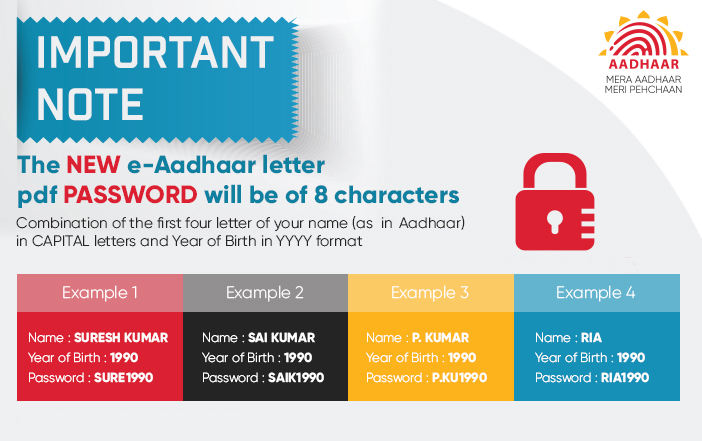 The New password formate contains 8 characters which are Combination of your first four letter of your name(as in aadhaar) in CAPITAL letters and year of birth in YYYY format. sir hume addhar card nikalana hai. lekin addhar card ki webside nahi chal rahi hai. Sir, I change my aadhar adrees with voter Id as proof of new address proff.Dated: 14 Nov 2017. But still now any msg not coming for changing status. How check this update status? Tel me the update status. I have allready applied last 14/03/2016 but i am not received still today.Please give me a possible soluation. i lost my aadhar car what will i do….